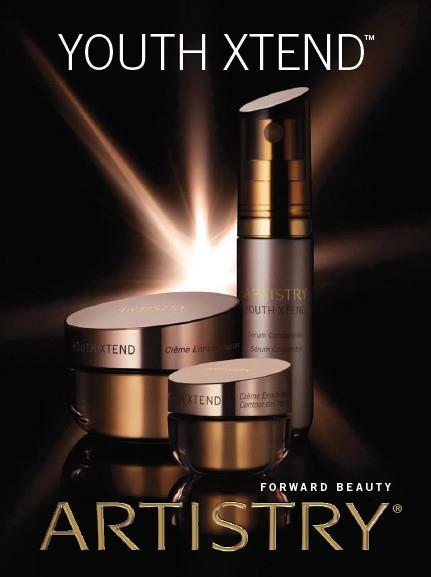 Early signs of aging are banished with Artistry Youth Xtend! The Artistry Youth Xtend skincare collection addresses the first visible signs of aging including fine lines and wrinkles, crow's feet and loss of skin clarity and radiance caused by UV exposure, free radical damage and lifestyle to help repair the appearance of past damage as well as protect it against future damage. All thanks to: LifeSirt - derived from the Mediterranean myrtle plant to help revitalize the look of skin; Micro X-6 Peptide with six amino acids to help reduce fine lines and wrinkles while improving firmness and elasticity; and a nutrient-rich extract from the fruit of the African baobab tree along with acerola cherry extract and black currant extract to deliver protective antioxidants plus soothing and moisturizing benefits. And while the Serum is the hero of the line, I have to say that my faves are the Creamy Foam Cleanser and Eye Cream. I like a thicker cleanser when the weather gets cold but creamy cleansers don't usually foam, which is something else I like in a cleanser - this one is creamy and foamy - perfect!